Even if the dangers which threaten an airman from the enemy are left out, enough difficulties which alone arise from the formation flight between 7000 and 8000 meters of height still remain. A bomber crew gets to the height of the Mount Everest and furthermore upward crafty with enormous speed of the sea-level. At a long-haul flight to Germany the men are, 8 to 10 hours in the air every minute takes danger and tribulation which. They must fight for her life, be wounded possibly without there being hope for right medical help. Fast and exact work is still demanded by every member of the crew from the board gunner up to the pilot to this in particularly restricting clothes: Everybody wears a boilersuit heated electrically over the woolen sub-train against the furious cold in 8000 meters of height. The uniform then comes. 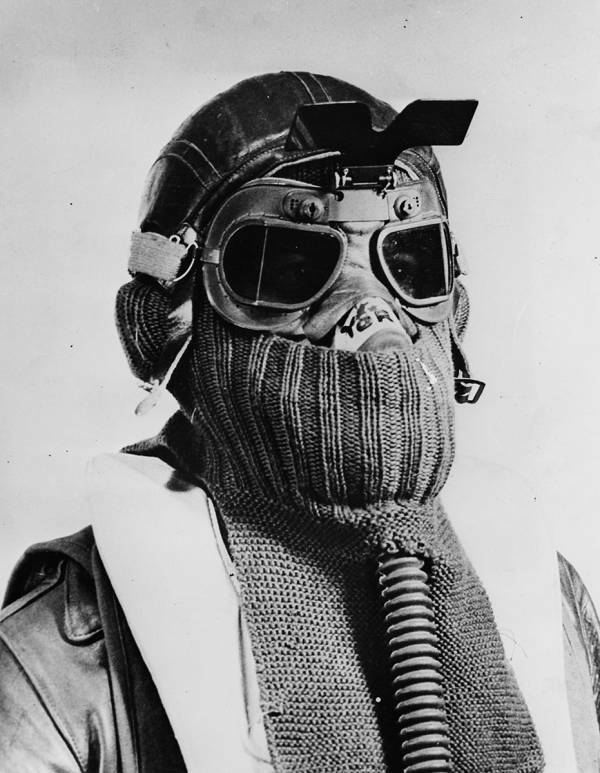 About this a sheepskin fed airman combination in which one can hardly move is drawn. But this isn’t everything: Everybody then puts himself for the chest and back tank about, for a thick coat of chain-mail which reaches of the neck the pelvis and shall offer protection against anti-aircraft gun splinters and machine gun bullets. Now glove heated electrically the men climb into the high sheepskin boots, the glaring yellow life preservers lay out, the parachute belts close and draw the thick ones last about. A warm cap and the steel helmet come onto the head. Equipment still is part of the clothes: Without an artificial supply of oxygen the airman would get unconscious in large heights in short time; so the oxygen mask around the neck hung (whose pressure on the face drifts during the flight almost to the despair later) is – the different one sticks the one over the ears, tight around the throat, distant headphone for the board speaking device and the necessary throat microphone. The pilot is buckled in his seat, further restriction for the movement liberty, and he then must take away 30 tons of steel and aluminum, loaded with fuel and bombs, of the ground. The tension starts from the moment at which the accelerator pedals are moved forward on full throttle on the runway. The speed increases to 150, 200 km/h before the heavy bomber of the ground takes off. Deviating least already from the runway would make the tires burst and convert the aircraft to a light and column of smoke. The whole crew holds its breath. But the plane hasn’t skidded, she’s flying. It will time now to lay out the oxygen mask so that the rubber himself slow into the skin einpresst. Now comes for the pilot the moment, his radio equipment so far turn on till the atmospheric perturbations and the hostile jammers are drowned. A deafening noise starts, however, no word may be ignored. To press now will it time for the pilot to constantly direct its attention toward over and beside it flying machines to hold and with the other four gashebel and the controlling of the four variable-pitch propellers into the correct situation bring with a hand the steering shaft, with the feet the rudder control pedals against the hard suspension – in short to remain exact in the formation while the machines hunt 100 meters per second forward and in gusty air on and .starting from stampfen. Contactors begin now to search in their rotating turrets systematically the sky for hostile hunters that can fall themselves each instant on the federation. The navigator begins sweating its incessant counting and controlling. Already after 2 or 3 hours the pilot feels pain in arms, legs and in the back; also the remaining crew feels rigid. The throat microphone begins to up-scrub the smallest shaving wounds in tormenting way; the edge of the life jacket rubs the cheeks wund. From the headphones, as soon as one flies over 6000 meters, an irritating noise sounds like a circular saw, which goes to one on the nerves. Cold weather creeps by the thick clothing. The oxygen mask presses itself on the face like a choking hand. Instinktiv would like to solve one it and away-tear; the reason forces however to omit it. At the latest in the fifth flying hour one must count each instant on the fact that German fighters over the combat forces emerge, in order to fall itself with howling engines on her. But with the bombers fly the Thunderbolt and mash seaweed fighters – for the bomber crews are more beautiful their dark, thick and elegant slim fuselage than the most beautiful girl body. The indication of the attack is the call of the top turret gunner: “Me-109-fighter five o’clock high. Ten of them.” After the first light pressure on the gastric region, which the message releases, everyone waits strained, until the roaring of the heavy twin machine guns of the top turret indicates that the fight began. From now on everything goes so fast that no time remains, being afraid. Projectiles squirt by the side with the noise of a pneumatic riveting hammer. The right waist gunner was hit. The copilot receives the order to render to it first help. Already in the next minutes the difficulties begin for it. The tightness of the area is worst: The copilot must loosen only the safety belt, which pull plugs out for heating and radio, the fuselage of the oxygen equipment to decrease and finally its seat parachute placing. If the machine is met during the next 10 minutes, then the copilot is that, which can bail out in no case. It hangs a portable oxygen cylinder over, winds themselves from its seat and squeezes themselves to the tail. Each individual fold of its flier combination seems to be created to remain hanging on all grasps, buttons, levers and edges from which there are innumerable the inside one the bomber. Beside the lower part of the upper emplacement it can do itself straight by urge, but only if the tower stands still; it pivots it the gunnrt however then the danger exists that it is seized and hurt by the transmission. The narrow course beside the bomb pit is full sharp-edged ribs and reinforcement. The right waist gunner hangs unconscious in his emplacement. The wind thunders with 60 degrees of cold weather by the capital invested opening in here. The wounded one needs disinfection powders on its wound, a druckverband, and its bleeding leg must be tied. With the thick, electrically heated gloves that cannot be made; the copilot puts it down therefore. If it has fate and luck and the combat formation fast takes, it can possibly tighten into 2 to 3 minutes its gloves again. In addition, then it will not come without memories of it. The air flow, which blows in here, is siberian cold. Those few minutes without gloves can mean easily a half year military hospital stay with vague hope that the fingers are saved. It concerns however the life of the comrade, and there it gives no Hesitating. The next problem copilots is it, itself by the fuselage interior again on its seat back preparatory work. Its oxygen cylinder is nearly empty, and it moves only laboriously forward. In the meantime the Flying Fortresses approaches gradually the target. The German fighters and the flak formed the emphasis of their defense here. Air is full burst clouds of the flak grenates. All evasive maneuvers, which a bomber makes, require the whole strength of the pilot. The crew counts the tormenting seconds. Finally get the most dangerous, the straight-line target approach, and finally the releasing call “bombs away!”. The formations turns home and again the same difficulties as on the way there, up to which gesegneten instant, in which it descends over the channel in the safe protection of the fighter squadrons.